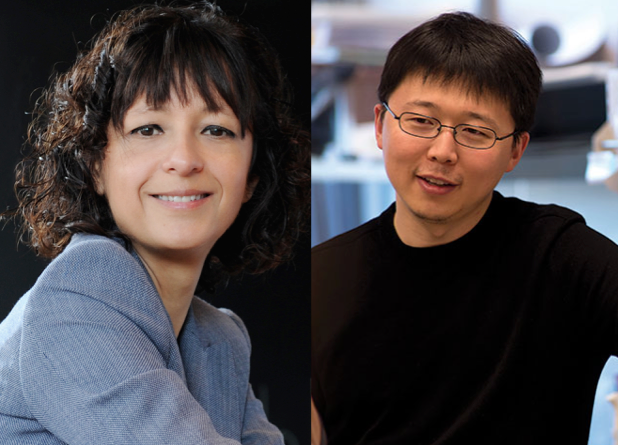 Congratulations to Feng Zhang (YIA 2013) and Emmanuelle Charpentier (VVP 2015) for being among this year's Canada Gairdner Awardees! They have been recognized for their work developing CRISPR-CAS as a genome editing tool for eukaryotic cells. Feng Zhang is a Core Member at the Broad Institute of MIT and Harvard, an Investigator at the McGovern Institute for Brain Research at MIT, and an Assistant Professor in the Department of Brain and Cognitive Sciences. He is a 2013 Vallee Foundation Young Investigator Awardee. Emmanuelle Charpentier is Scientific Member of the Max Planck Society and Director at the Max Planck Institute for Infection Biology in Berlin, Germany. She is Alexander von Humboldt Professor in Germany and Visiting Professor at Umeå University in Sweden and was appointed a Vallee Visiting Professor in 2015. For their work on CRISPR-CAS, Zhang and Charpentier shared the Canada Gairdner International Award jointly with Jennifer Doudna (Stanford University), Philippe Horvath (DuPont), Rodolphe Barrangou ((North Carolina State University). Further details can be found here.